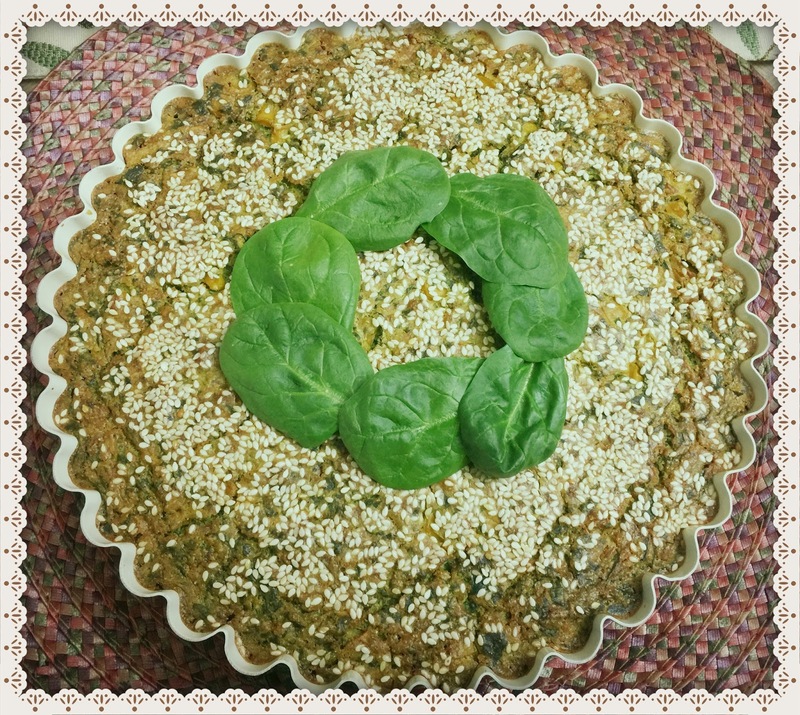 Savory Spinach Cake and Good to be Back ! Oh Boy ! Guess who is back ? Yours truly of course ! 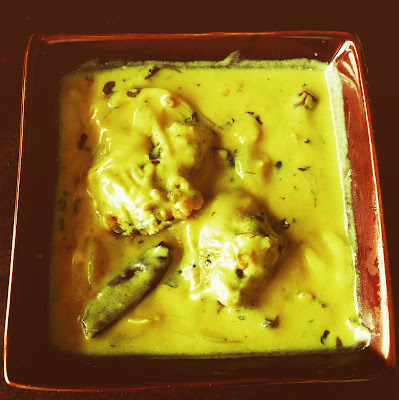 !.If you guys are reading this , then I have been successful in breaking the bloggers block( lot of b words ..I know) though full credit should go to the lady who stopped me at the hasya kavi sammelan yesterday , introduced herself and mentioned how she enjoyed visiting my blog and trying out the recipes . 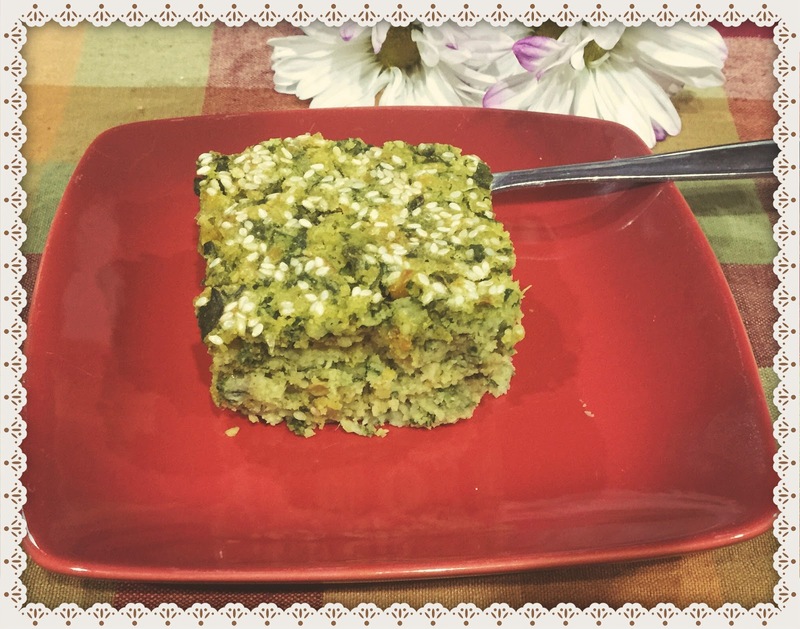 Needless to say this conversation uplifted and inspired me enough to write a new blog post and here I am sharing with you a savory recipe of spinach cake which I made for a book club meeting last month and was an instant hit . Fellow book lovers have asked for the recipe on more than one occasion and now, I can finally share it. Apologies for the delay but the migraine headaches were winning the battle against my already weakened enthusiasm. Hopefully , the next rounds will all be in my favor for I really hope to share my baking journey with my gentle readers. 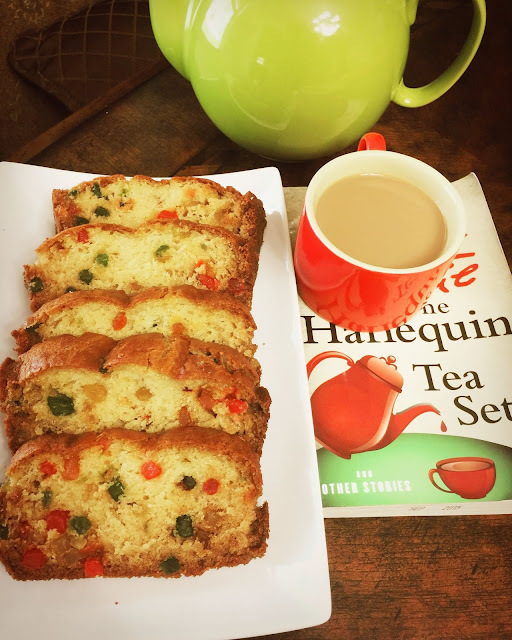 I did not take a break from baking ..it was just the blogging which suffered. 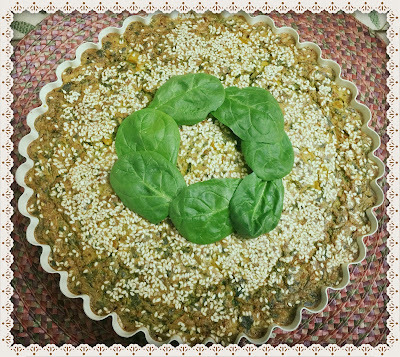 As such , I have many new recipes to share with you but for now let's concentrate on this savory spinach cake. You might be amused/surprised to read the ingredient list for this one. It has grated onions and green chillies to name a few. Did I mention curry powder ? 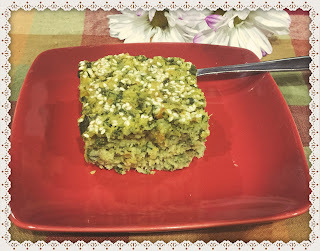 The result is a finger licking good savory snack which can be enjoyed guilt free with a hot cup of kadak chai. Don't wait for a book club meeting to bake it , anytime you have friends over , this serves as a wonderful appetizer choice. It is quite filling as well , so you can limit those other greasy fried snacks . I have already baked it twice as evident from the pics - once in a quiche pan and the other time in a rectangular casserole. You are free to go with your baking pan of choice. If curious about the book club selection , I thoroughly enjoyed this 600 page historical fiction (our chosen genre for May) though keeping track of all the characters was quite a tedious job . The setting was in the court of Henry the VIII and the expected drama made for an interesting read. NPR has a successful TV series of "Wolf Hall " and I am already looking forward to watching it. Yes , I am sucker for series inspired by books . 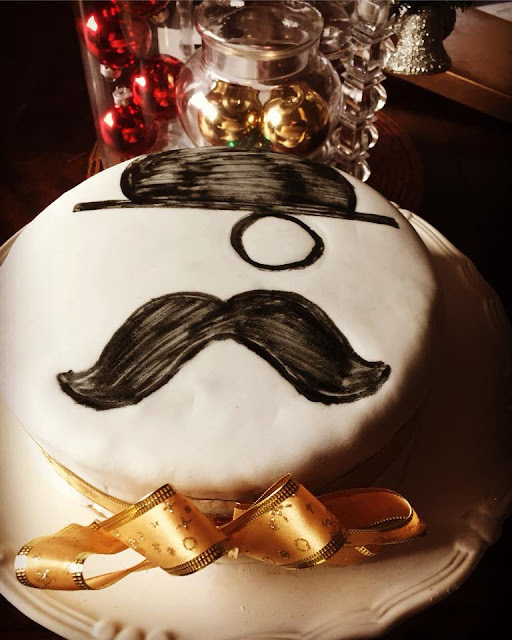 Words can't do justice to how much I enjoyed watching "Poirot" and then re-reading the books. 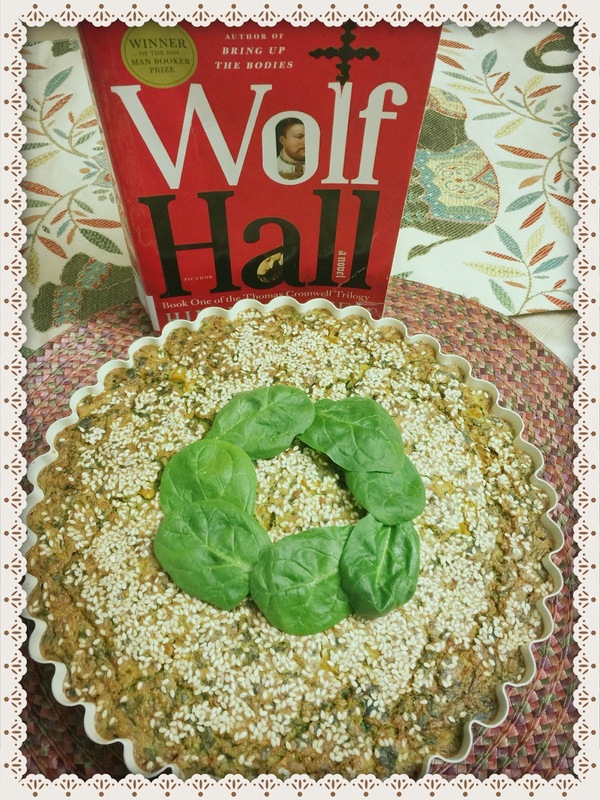 Books and baking are my passion and I can easily switch between the two .So, coming back to the latter , please note down the recipe for this savory spinach cake . 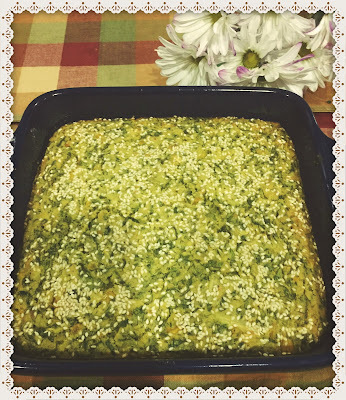 You can also call it spinach corn cake if you are so inclined. Pre heat the oven to 180 degrees C or 350 degrees F . Grease and flour a quiche pan or any baking pan of your choice. Sift the flours ( corn meal (or semolina) , cake flour and chickpea) in a bowl and add salt, baking powder and curry powder . Add the onions , corn , spinach , garlic paste and green chillies. Mix all of them well. In a separate bowl , whisk the room temperature eggs , oil and milk. 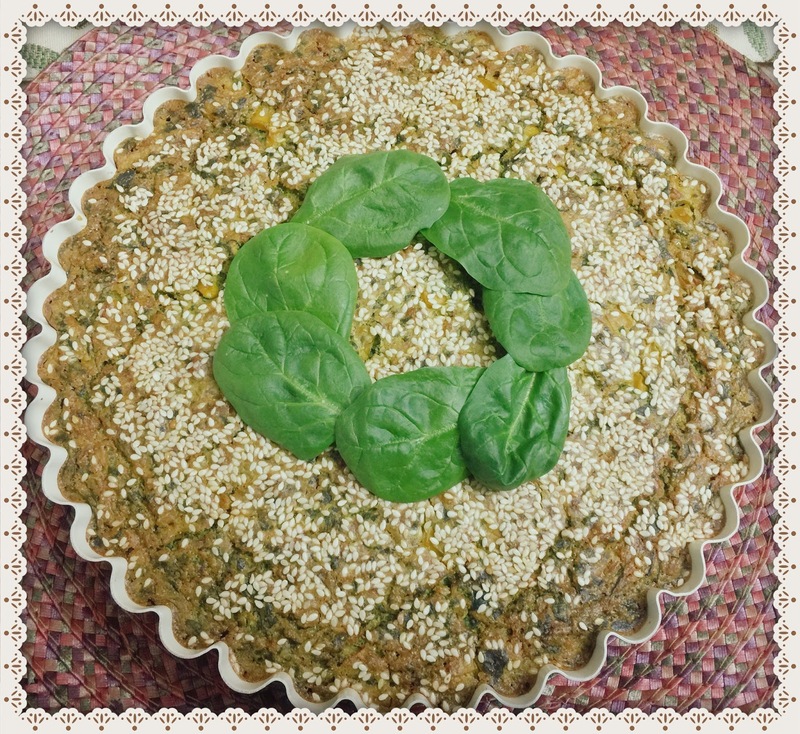 Pour the egg mixture into the flour and veg mixture, It will have a thick consistency . 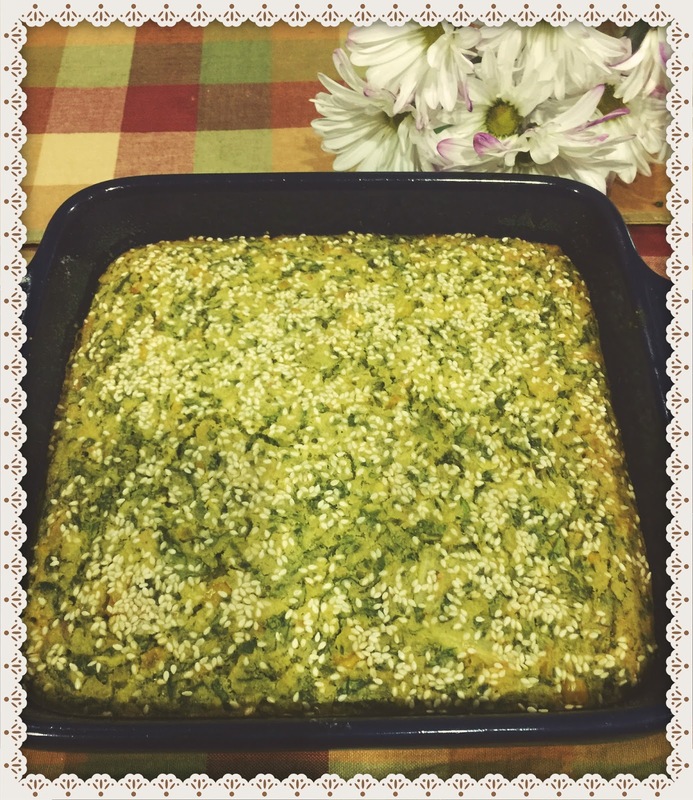 Pour the batter into the baking pan and sprinkle some sesame seeds on top. Bake for a good 45- 50 mins till a tooth pick inserted in the center comes out clean. Let it cool , cut into small pieces and enjoy .